I have always loved playing RPG games ever since Final Fantasy VII dominated the market in the 90s during the PS1 era. I fancied these turn-based games because it has an element of strategy to it. Shortly afterwards, I was able to play Final Fantasy Tactics. It was an even more engaging game as players are able to explore a 3-dimensional world through a checkered terrain similar to chess. Worth mentioning is Vandal Hearts as well, with its beautiful animation, engaging storyline, and character development. I thought demand for these types of games have died down. But I was pleasantly surprised to discover the game Jeanne d'Arc (that's in French), also known as Joan of Arc or Maid of Orleans to most of us. Yes, the game is based on the national heroine of France, a simple, countryside lady who, by divine intervention, led the French to many successful battles against the English. To many who are familiar with the story of Joan, she was captured by the English and burned to the stake with heresy as the crime when she was just 19. If this were so and the game was an adaptation of her life, then the ending would have been quite predictable, right? Well... the game "borrows" the real-life Jeanne's character but the story is loosely based on historical facts. It has some twists and turns that takes a jab at history while at the same time adding elements of fantasy (such as demons and armlets with mystical powers) and magic that are intrinsic elements of the gameplay. The best part of this strategy RPG is that it is played out on battlefields reminiscent of Vandal Hearts. You control as many as 7 characters with various jobs, depending on the weapons they are able to muster. However, unlike other RPGs where only Mages and Wizards can work magic, in this game anyone can cast spells aside from their special abilities. I have been playing the game for quite some time now and found it truly engaging. While the level of customization is limited to equipping weapons and skills, you can mix elements together with the help of the frog character Cuisse) which results in a new, more powerful element. And I am quite sure there are hidden items throughout the game but I am doing the no-cheats and no-walkthroughs strategy with this one. 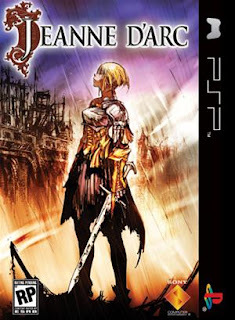 If you are a fan of strategy RPGs, Jeanne d'Arc will not disappoint. Developed by Level-5 and published by Sony Computer Entertainment for the PlayStation Portable [PSP].